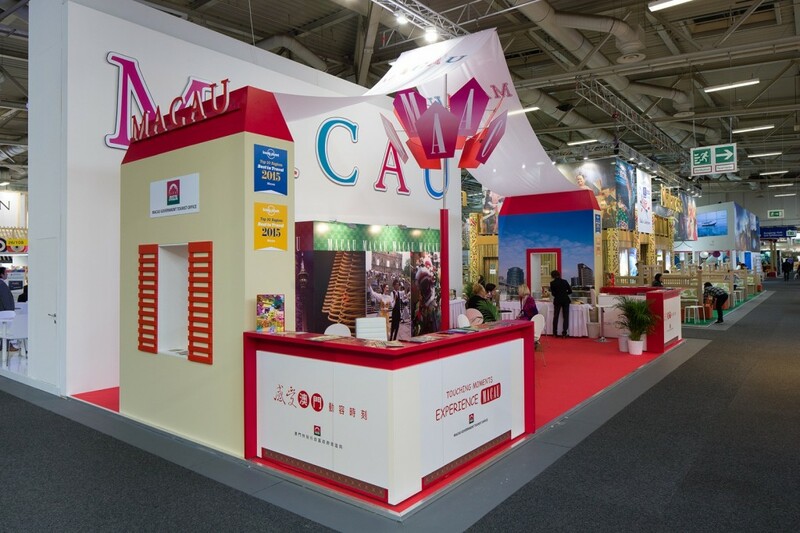 MACAU, 2015-3-11 — /Travel PR News/ — Macau Government Tourist Office (MGTO) promoted Macau’s tourism products and diverse tourism image at the renowned international tourism trade fair, ITB Berlin, towards industry partners from around the world. ITB Berlin 2015 was held from 4 to 8 March in Berlin, the capital of Germany. Boasting a size of 63 square meters, MGTO’s booth was designed after the theme “Touching Moments, Experience Macau” to promote the rich and diverse tourism elements of Macau by showcasing the latest and upcoming tourism facilities, walking tour routes and other tourism products, etc. MGTO took hold of this prominent occasion to enhance Macau’s reputation and gain wide recognition among local citizens and worldwide trade visitors, which ultimately facilitates the development of long-haul markets. MGTO representatives met trade partners and discussed business opportunities, seizing every chance to promote Macau. They also introduced various walking tour routes to visitors, striving to attract more visitors from different markets to Macau, to stroll around and explore different quarters of the city, including Taipa and Coloane, as a fascinating way to enjoy Macau’s diverse scenery and experience local customs. In addition, MGTO’s Macau promotional video received the silver award in the category for best regional video in the Golden City Gate Tourism Media Award held during the travel fair. Golden City Gate was held for the 14th edition with the promotional artworks judged by an international jury to honor outstanding tourism promotional works from around the world. The ITB travel fair boasts more than 40 years of history and enjoys worldwide recognition as one of the largest international travel trade shows in the world. With over 10,000 exhibitors from 186 countries, this year’s ITB Berlin attracted a total of 175,000 trade visitors and consumers. This entry was posted in Tourism, Travel, Travel Management, Travel Marketing, Travel Services, Travel Tips & Info and tagged ITB Berlin, Macau Government Tourist Office, Macau’s tourism products, tourism. Bookmark the permalink.